En suite bathrooms can be an excellent addition to your home, especially if you have one or two bathrooms and need more. An additional bathroom will be convenient, and will increase the value of your home. If you want reliable contractors for en suite bathroom installations, you don’t need to look beyond AC Joinery. We have an expert team of designers and installers who’ll make sure your en suite bathroom fits in well in your home. 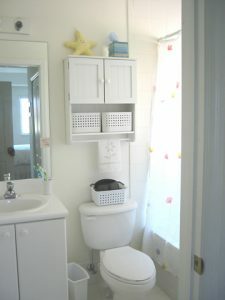 How Do We Handle Intalling an En Suite Bathroom? Consider What You Need – En suites come in different shapes and sizes. Some are full-fledged bathrooms with bath tubs while others are small spaces with just the toilet and a shower. Our designers will consider your requirements and plan a bathroom accordingly. We’ll also consider your budget and make sure our en suite bathroom installations fit into it. Space – When we build en suites, we’re working with a limited space. Our designers will study your home carefully to determine how to fit the en suite into the available area. These bathrooms are more compact than regular bathrooms so it’s important to utilise the space carefully and that’s exactly what we do. Building Regulations – We’ve been a part of this industry for a long time so we’re very familiar with the building regulations. We’ll make sure your bathroom doesn’t violate any regulations and will help you get all the permissions you need to begin the project. Once we have all the information we need, we start the design and construction part of the en suite bathroom installations. What Do We Consider During the Project? We will look at and plan for the light sources to ensure the bathroom is bright. Our installers will consider the bathroom wall structure and use materials that would tolerate high-moisture environments. Our designers will also consider the plumbing and heating systems in your home, and plan an en suite bathroom around them. If you want to know more about our en suite bathroom installations, don’t hesitate to get in touch with here at AC Joinery, us. You can call us at 0161 980 7992 or contact us through our web form today.